A Minneapolis-based firm has proposed an ambitious plan to redevelop nearly three blocks of a commercial strip along W. Broadway Av. in north Minneapolis. 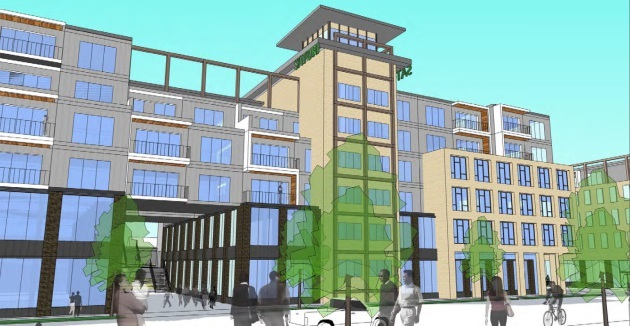 According to preliminary documents submitted to the city, Minneapolis-based Pinnacle Management LLC has proposed a mixed-use development for the 800, 900 and 1,000 blocks of Broadway. Plans for the development, called Satori Minneapolis, include 254 residential units, 86,000 square feet of commercial space, 45,000 square feet of office space and 679 above-ground and underground parking spaces. Pinnacle submitted plans to city planners in order to gauge initial feedback. However, the developer currently does not have control of the properties along Broadway, so the city can take no official action on the matter. The Planning Commission will review the plans next Thursday. Currently, the blocks are populated by older buildings that are two and three stories which would be razed, if plans move forward. Officials from Pinnacle could not be reached for comment Friday. Mortenson proceeds with 30-story apartment tower in downtown Mpls.